As we ventured to solve one of healthcare’s most critical problems—medication non-adherence—while developing the LIVIT virtual care system, we learned a few things. First, non-adherence is a bigger, more far-reaching problem than even we realized. This was not a surprise. But more importantly, non-adherence is at the center of some of the United States healthcare system’s most prominent drawbacks: cost, inefficiency, and poor patient outcomes. We believe that LIVIT holds the key to solving many of these problems by addressing non-adherence through medication tracking, data transparency, and patient engagement. It all starts with understanding non-adherence. Medication non-adherence is one of the most troubling problems facing our healthcare system today. According to the Centers for Disease Control and Prevention (CDC), approximately 3.8 billion prescriptions are written in the US every year. Of those, approximately 20% are never filled. 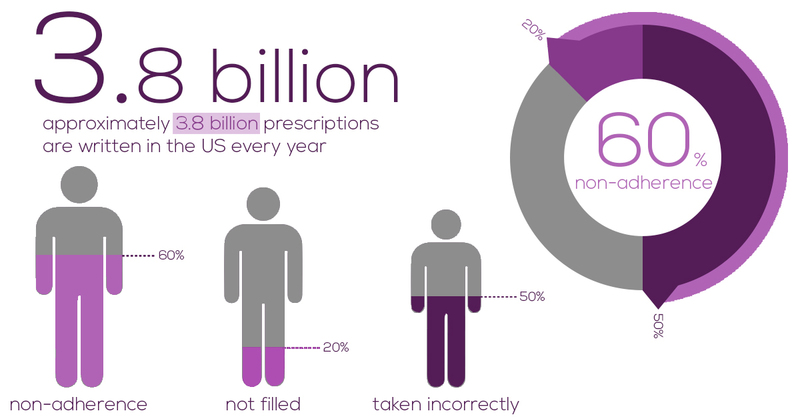 Among the prescriptions that are filled, approximately 50% are taken incorrectly. This means patients don’t follow the prescribed dosage, timing, frequency, or duration. Often, it’s a combination of at least two of these factors. Altogether, approximately 60% of patients are not adhering to their medications either because they don’t fill the prescriptions or they take them incorrectly. The CDC contends that patient-related factors, either unintentional or intentional, account for a great deal of the cases of medication non-adherence. Unintentional factors are typically related to patients’ forgetfulness—especially if the medication regimen is complex. Patients often forget to take their medications, or forget to get refills, because they don’t understand their prescription. But there are intentional factors, as well, when patients consciously fail to adhere to their medications. Often, this corresponds to the cost of the medication and patients’ inability to pay, but it can also be related to side effects and expectations of improvements. In other words, people “feel better” and stop taking their medications. The various factors of medication non-adherence have troubling consequences. The CDC says that medication non-adherence is associated with higher rates of hospital admissions (and readmissions) and increased healthcare costs. More importantly, non-adherence leads to poor healthcare outcomes for individuals—with increased morbidity and mortality in the worst cases. Medication non-adherence is a significant contributor to overall rising costs and inefficiency plaguing the US healthcare system. The National Health Policy Institute, for example, found the system spends $105 billion in potentially avoidable costs due to medication non-adherence. It’s clear that addressing non-adherence could be central to not only reducing the overall cost of healthcare but also in creating better healthcare outcomes. Over the years, multitudinous companies and organizations have proposed strategies to address medication non-adherence with varying levels of effectiveness. Pharmacies and drug manufacturers began offering pillboxes and blister packs to help patients keep medications organized, which has had some benefit but still relies on patients having a firm understanding of their dosages and regimens. Another study found that a team-based approach, or coordinated care, was effective in reducing non-adherence. In this approach, pharmacists, physicians, and other caregivers work together to ensure patients understand their medications and actively remind them to take their correct dosages on time. Coordinated care, however, is labor-intensive and non-sustainable as an adherence solution. Technology appears to have the greatest potential for helping to solve the problem. In a 2011 study, providers using electronic prescriptions were able to increase first-fill medication adherence by 10%. Furthermore, software solutions make it possible to monitor prescriptions dispensed and refilled. Though other technological solutions have been proposed and attempted with varying success, many of them add layers of complexity to the healthcare process—complexity that must be endured by the patients. If there’s one thing people want, even more than better healthcare, it’s simplicity. The more complicated a process is, the less likely people are to follow it. From the beginning, we designed LIVIT to be simple. If patients don’t want to, they don’t have to interact with the LIVIT virtual care system at all; they just need to take their medication as prescribed, and if they ever become non-adherent, the system automatically prompts them to correct their behavior. This seamless interaction allows LIVIT to be as prominent or as invisible in a patient’s life as necessary to ensure medication adherence. By focusing on the user experience first, and designing it to be easy, LIVIT is able to effectively address the medication non-adherence problem at its root: the patient. This approach will not only help patients but it will also provide data transparency to all healthcare stakeholders; thus allowing them to see medication adherence trends at the individual patient level, at the broader system level, and anywhere in between. Most importantly, LIVIT will help to create better healthcare outcomes for individuals and positively influence the system’s efficiency.